Valuation analysts (“analysts”) who provide forensic valuation services for controversyrelated purposes should have a fundamental understanding of the alternative standards of value. Depending on (1) the legal jurisdiction and (2) the nature of the legal claim, the relevant valuation standard—and how to interpret the relevant valuation standard—may be an unsettled matter. Because shareholder disputes are typically governed by state law, analysts should rely on instructions from legal counsel regarding the appropriate standard of value to apply in the forensic analysis. Nonetheless, analysts who practice in this area should be generally familiar with all the alternative standards of value, premises of value, and levels of value. Even when a generally accepted business valuation standard is defined by statute or judicial precedent, the analyst should select and apply appropriate methods to develop the conclusion of value. With regard to fair value controversies decided in the Delaware courts, the analyst should be aware of recent judicial developments—and the fair value implications of such developments. 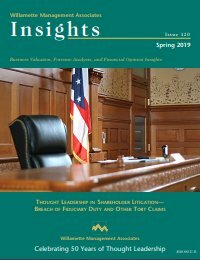 The Delaware Court of Chancery decisions on the treatment of synergistic value in dissenting shareholder appraisal rights cases provide meaningful guidance to valuation analysts (“analysts”), legal counsel (“counsel”), and other courts. This discussion focuses on recent judicial decisions issued by the Delaware Court of Chancery where synergistic value was a consideration in a dissenting shareholder appraisal rights matter. This discussion provides insights related to the treatment of synergistic value within the context of a statutory appraisal rights fair value controversy. In statutory shareholder appraisal rights and shareholder oppression matters, various state statutes and judicial precedent provide conflicting guidance as to the measurement of fair value. For the most part, shareholder appraisal rights matters—and shareholder oppression matters—typically involve the fair value of equity shares determined without consideration of valuation discounts. In certain matters, however, there is judicial precedent for the inclusion of a valuation discount. This discussion focuses on fair value valuation analyses, and this discussion provides examples of judicial decisions regarding the application of valuation discounts in statutory fair value matters. The treatment of nonoperating assets and nonoperating liabilities in a private company business valuation may have a material impact on the value conclusion. When considering the treatment of nonoperating assets and liabilities, there are two primary factors that the analyst may consider: (1) the standard of value and (2) the level of value (noncontrolling or controlling ownership interest). Based on the facts and circumstances of the valuation, the analyst may decide (1) whether to adjust the business income to exclude any income or expenses related to nonoperating assets and liabilities and (2) how much value to assign to the nonoperating assets and liabilities in the value reconciliation. The analyst should develop an understanding of (1) the different standards of value and (2) the differences between a noncontrolling ownership interest and a controlling ownership interest. The analyst should apply that understanding in deciding how to treat the subject company nonoperating assets and nonoperating liabilities. Lisa H. Tran and Tia R. Hutton Damages analysts (“analysts”) are often asked to measure lost profits damages in either breach of contract claims or tort claims. Typically, a plaintiff will establish three principles in order to be awarded damages related to a lost profits claim: proximate cause, foreseeability, and reasonable certainty. While it is the primary responsibility of plaintiff’s legal counsel to prove a lost profits claim, the analyst can assist counsel with the task. That is, the analyst can develop a lost profits measurement that is credible and supported by the facts of the case and by relevant market data. In the Horizon Health Corporation v. Acadia Healthcare Company, Inc., decision, the plaintiff could not recover lost profits. This is because the court concluded that (1) the plaintiff’s testifying expert presented an analysis that was speculative and (2) the evidence was insufficient to support the plaintiff’s lost profits claim. Working capital adjustments are a typical feature in merger and acquisition (“M&A”) transactions. The working capital adjustment mechanism ensures that both the buyer and the seller in an M&A transaction are made whole. That is, the buyer realizes the value of the purchase price. And, the seller does not transfer any excess cash and assets to the seller—beyond what was paid for in the purchase price. This discussion examines the mechanics of working capital adjustments. This discussion considers working capital disputes, and it describes multiple financial accounting considerations in the dispute process. This discussion provides perspective on the interaction between working capital disputes and the target company valuation. Finally, this discussion analyzes the implications of an important Delaware Supreme Court decision involving a working capital adjustment. An understanding of the financial accounting, valuation, and legal considerations associated with working capital adjustments and working capital disputes is important to both the transaction buyer and the transaction seller. In most forensic-related valuation analyses, one procedure that affects most valuations is the measurement of the present value discount rate. This discount rate analysis may affect the forensic-related valuation of private companies, business ownership interests, securities, and intangible assets. This discussion summarizes three models that analysts typically apply to estimate the cost of equity capital component of the present value discount rate: (1) the capital asset pricing model, (2) the modified capital asset pricing model, and (3) the buildup model. This discussion focuses on the cost of equity capital inputs that are often subject to a contrarian review in the forensic-related valuation. Valuation analysts (“analysts”) are regularly engaged to provide fair market value opinions related to not-for-profit business entity transactions. Not-for-profit business entities are often involved in arm’s-length transactions, sometimes with for-profit business entities. Some of the typical transactions include royalty payments for the use of intellectual property, royalty revenue earned by licensing intellectual property, sales of assets, and purchases of assets. If the subject transaction is between a not-for-profit entity and a related party, then the transaction is required to be a fair market value transaction. This discussion provides an example of the methods and procedures that analysts can apply to value the transferred tangible property and intangible property of the not-for-profit entity. This discussion considers the review and assessment of prospective financial information. Specifically, this discussion describes the behavioral bias that may influence financial projections. This discussion should inform any party involved in compiling or assessing financial projections. This discussion is particularly relevant for fiduciaries who may be involved in the transaction or other investment decision-making process.